EghtesadOnline: A sectoral review of the Central Bank of Iran's latest report on Iran's economic growth shows the oil sector had the biggest contribution to the gross domestic product during the first quarter of the current fiscal year (March 21-June 21). The report released on Sunday shows Iran's economy grew by 1.8% during the period compared with last year's corresponding period. GDP growth, excluding oil production, stood at 0.7%. In fact, the oil sector, with a 5.2% growth, single-handedly accounted for about 1.2% of the overall 1.8% growth in the overall economy during the first quarter, meaning oil production had a 66.66% share from Iran's economic growth. The CBI report also shows the services sector grew by 1.1% while the sectors of agriculture and the "industries and mines" grew by 0.3% and 0.1% respectively, according to Financial Tribune. Iran’s economy emerged from recession in the fiscal 2014-15 with a 3% growth after two years of recession when the economy contracted 5.8% and 1.9% back to back, the Central Bank of Iran said. Growth in 2015-16 stood at -1.6% before drastically rising to 12.5% in the 2016-17 fiscal, the year international economic sanctions against Iran officially began to roll back as part of the nuclear deal the country signed with world powers in July 2015 (formally known as the Joint Comprehensive Plan of Action). The astronomical growth experienced in Iran after the removal of sanctions owed to a great extent to Iran's ability to increase its oil sales. Later, however, as crude output was ramped up and the production capacity neared pre-sanctions levels, growth in the key sector slowed down. This slowdown is evident in the new CBI report, which shows oil sector growth stood at 5.9%, 5.7%, -3.3% and -4.2% in Q1 to Q4 2017-18 fiscal year. 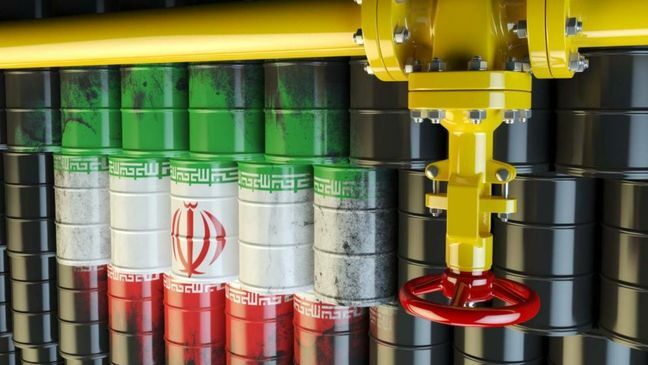 With the United States reimposing sanctions against Tehran and forcing other countries to stop importing oil from Iran, growth in this sector is expected to decline further in the months ahead. The bounce-back to 5.2% growth in Q1 could be seen as indication that production ramped up before the sanctions took effect. US President Donald Trump announced on May 8 his withdrawal from JCPOA and promised to return harshest sanctions in history against Iran. The first round of renewed sanctions entered into effect on August. The unilateral US sanctions reimposed on August 7 prohibit Iran's purchase of US dollars and precious metals, part of a larger move that attempts to cut the country off from the international financial system. A second tranche of US sanctions on Iran's oil and gas sector are set to go into effect on November 4. Many of Iran's oil buyers have already scaled back imports from the country. Obviously, a decline in oil production, the main driving force behind Iran's economic growth, will translate into a sharp fall in overall GDP growth. Apart from oil, the only other sector contributing to GDP growth in the first quarter was the services sector, which accounted for about 0.5% of the overall 1.8% economic growth. This is while the other two sectors of the economy, namely agriculture and "industries and mines", had zero contribution to GDP growth. The services sector employs nearly half of Iran's working-age population. Notably, the sector had the biggest contribution to total gross domestic product among all other sectors in CBI's quarterly report. Oil, "industries and mines" and agriculture followed in a descending order. Among the subsectors of services, the "transportation, warehousing and communications" group saw the highest growth of 5.7%.